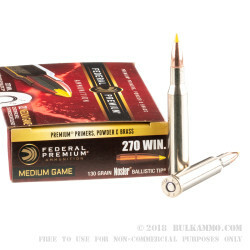 A brilliant deer season round that can go from deer to antelope to elk easily without concerns and offers excellent stopping power. 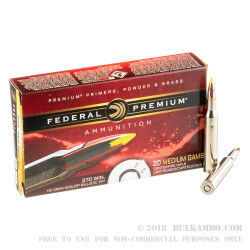 The 130 grain projectile in this Federal Premium load is the fantastic Nosler Ballistic tip. 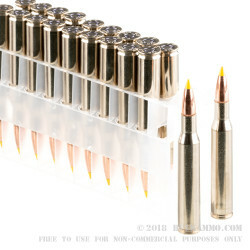 This is considered a high level premium load for the .270 Winchester cartridge. The subsequent performance of the round makes it suitable for game of all sizes within the category it fits. This round can easily take the largest deer and moderate to large elk with well-placed shots. Beyond that, it is suitable for varmint work if needed in a pinch and certainly has application in the small and moderate range for game animals. Pushing over 3060 feet per second out of the muzzle and 2703 ft. lbs. of energy makes it a round that inspires confidence. The more important variables in the equation though, are the component choice and the Federal Premium production process. This process is superb, with excellent quality control and impeccable reliability as a result. 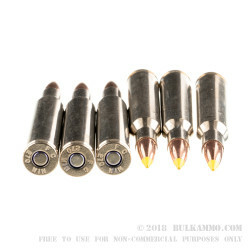 The component choice includes of course, excellent thorough burning powder and a Nosler bullet. The Ballistic tip offers a controlled expansion and great weight retention as well as the thicker bullet base that ensures proper dynamics during and after expansion.